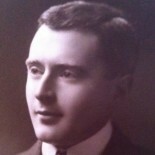 Dr. Sutherland set out for a speaking tour of Australia and New Zealand in 1939. On the way, war broke out. The Canberra Times described his tour as “the most extensive lecture tour yet undertaken in this country by either an Australian or a visitor from overseas” and he spoke twice in each of the capital cities and once in each of the large provincial towns. During his tour, a 15-minute talk entitled “What the British Empire Means to the World” was broadcast nationally by the Australian Broadcasting Corporation. The transcript, recently discovered in Dr. Sutherland’s papers, is reproduced below. In the first place, I was most grateful for the honour of broadcasting in Australia, and for the privilege of speaking directly to those of you who hitherto have only known me though my books. It is also pleasant to recall that this visit was first suggested by your great dead premier, Joe Lyons, than whom there have been few statesmen more honest, singleminded and sincere. I had hoped to be here in happier times, and yet today I feel less of a stranger amongst you because now, for the second time in twenty five years, the Commonwealth of Nations under the British Crown are united in their determination to resist and to destroy a menace to our Empire and to all those ideals which for us makes life worth living. Those ideals include liberty of thought and action so long as the rights of others are not infringed, a sense of justice and a belief that Right is greater than Might. Human nature being what it is, few of us men and women have consistently acted up to our ideals, and no country or Empire can be greater than the citizens of whom it is composed. For that reason not all the wars waged by England in the past have been just wars. For example, no one would now defend the war to force the Chinese to eat Indian opium, but it’s to be remembered that the Chinese war was denounced at the time, and in no measured terms, by William Ewart Gladstone and by a large section of the British people. The point is that with all our faults and deficiencies the British Empire has made a contribution to civilization of which none of us need to be ashamed, and that we can face with impunity the venom of those who are now leading our deluded enemies. On my way to Australia I was detained in India, and listened to a German broadcast in English. The speaker wanted to know who sunk the “Athenia”, why she sunk so near to England and so far from Germany, and why there were Americans on board. He answered his own questions by saying that Winston Churchill put the Americans on board and then sank the ship in order to bring the Americans into the war. Winston Churchill was playing his old game as he played it in the Great War. Now in lunatic asylums perhaps I have heard many strange suggestions, but never before had I heard it suggested that Mr. Churchill was responsible for the sinking of the “Lusitania”, an action which more than any other in the moral field brought America in to the last war. Now you may smile at the mental deficiency or you may frown at the turpitude of anyone who broadcasted such garbage, but remember that lies such as these are being broadcasted every day and in the native language to illiterate peoples under the British flag in Africa and in India. There was a grim humour, you know, about that broadcast because the speaker much have known that a German caught listening to a British broadcast was liable to penal servitude for life, and any German repeating a British broadcast was liable to be executed. Yet there was I, sitting at my ease and stroking a tame deer, a black buck, on the verandah under the pillared porticos of Lauries’ hotel at Agra, overlooking green lawns, the swimming pool, and a background of spreading trees, neems and acacias, date palms, tamarins and the golden mohur—there was I listening to my heart’s discontent and without the slightest risk of being imprisoned by the Indian Government. And here I am tonight, telling you all about it and feeling fairly hopeful that I shall not be shot at dawn by the Australian Government. Touch wood. Now that I think, is a fair example of the difference between tyranny and liberty. The German speaker proceeded to say that the British Empire was obtained by piracy. In answer to that let us admit that large portions of the Empire were obtained by conquest, but it was conquest under the British flag, and that is not piracy. Moreover, the victims of religious and economic persecutions were no pirates—the Pilgrim Fathers in New England, the Catholics in Maryland, and my own Highland people driven from their homes and across the Western Ocean to the wilds of Canada. Nor were they pirates who blazed the trail in Australia, in New Zealand, and in recent years, in New Guinea. Apart from the origins of the Empire, what has it meant to those peoples who are under the British flag? From what little I know of the world, I believe that our dealings with subject races we have nothing to learn from any other colonising power. Not that everything in the Imperial garden is lovely. because only a few months ago public opinion in Britain was shocked by reports of social conditions on the west coast of Africa and in the West Indies, where labour had been exploited for private gain. These conditions can and must be rectified. There is also much to rectify in the homeland, and the idea that one million un-employed in Britain is a normal state of affairs must be up-rooted, root and branch, from our economic system. During the last war Lloyd George said that England was to be a country fit for heroes. After the war a Cockney pensioner was in my hearing; “Talk about a country fit for ‘eroes to live in, a man’s got to be a blinkin ‘ero to live in the blinkin country”. That must not happen again. And what has the British Empire meant to other nations? During the nineteenth century Britain created a world wide network of international trade out of which she amassed vast wealth. Yet England was no dog in the manger. Her motto was Free Trade and Fair Play, so that the nationals of every country in Europe and of America were free to participant in world trade, without the responsibility of holding the frontiers of an Empire and of ensuring the freedom of the seas. As soon as any European left the shores fo Europe, he or she was under hte Pax Brittanica, and in the main it was British prestige that protected the lives and liberties of the white races in foreign lands.In other words, Britain has been the leader of a civilisation whose traditions are European, whose culture is Western, so that if in this war Britain were defeated—if we lost our posessions in the Far East, if we lost India, and the control of the Suez Canal—all Western Europe and the United States would share the consequences of that defeat. As things are, the Royal Navy holds the seas, and were it not so, I could never have reached this microphone tonight. Yet nothing in this world is permanent. In the Far East our prestige is not what it was, and the time may come, when for lack of man power, Britain may have to withdraw her legions as did the Roman Empire long ago. In that event, who shall take our place? That is a question of paramount importance, because if there be no great power to take our place, then Western civilization is finished. After the Great War, when American prestige was at its zenith, it seemed as if the United States were about to take the lead in world affairs. Nor would Britain have raise the slightest objection, because as far back as 1901 we abandoned the protection of the Panama Canal in favour of America, and in 1921 we agreed to the principle of naval parity with the United States. If needs be we were reconciled to New York replacing London as the clearing hour of the world, and to the development of the United States into a great mercantile and naval power. Yet to-day one power only is anxious to take our place—Germany. Had she refrained from War in 1914, her commerce would by now have penetrated to every corner of the earth, because her business men were then more enterprising and methodical than ours. Today she is technically equipped to exercise world dominion and from events of the past two years it is not difficult to visualise a world dominated by Hitler and his ideas. It might be a more prosperous and productive world, and problems which Britain is slow to solve might be solved by the stroke of the pen—or of the axe. Yer it would lack the toleration of the British Empire, in which the adherents of over 400 religions are free to follow the dictates of conscience. In place of this freedom we would have the most degrading form of slavery—intellectual slavery. Already the young people of Germany have been deprived of God’s most precious gift—the use of Reason and the right to think for themselves. Can you imagine anything more horrible than a world of human automatons, blindly blaspheming the Laws of God and the teaching of Christ? If that is to be the next phase of civilization it is far better that we all perish, go down with flags flying, and leave our record to the judgement of God. Between English earth and sky. Ticket for S.S. Awatea from Wellington to Sydney in Dr. Sutherland’s personal papers. This entry was posted on 26 January 2017 by markhsutherland in Australia, Southern Journey.